During the holiday season, evergreen plants adorn houses all over the world. For the northern climates, the outside can be dreary, cold and devoid of life. Decorations of green-leaved plants and bright red berries add spark and life to our homes. Through generations of tradition, decorative plants such as holly, mistletoe and occasionally the yew plant provide a backdrop that helps bring the holiday feeling alive. “I saw mommy kissing Santa Claus, underneath the mistletoe last night”. 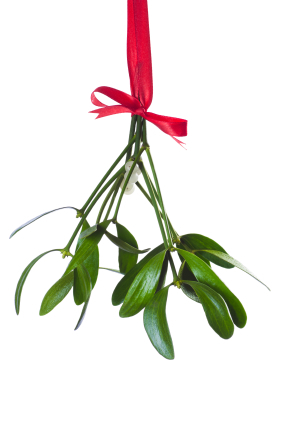 Mistletoe has decorated kitchens, doorways and barns of many homes for generations. Despite their beauty, ingestion of the berries and leaves can cause nausea and vomiting; very rarely, there are reported cases of drowsiness, confusion and seizures from possible ingestions of the plant. However, most the exposures involve small amounts of the plant and cause few, if any, worrisome symptoms. TIP: While the plants are often hung high, having them in a clear netting to catch any falling berries can prevent small children from eating them. Holly is another beautiful plant with lively green leaves and bright red berries. They add color to our rooms and gathering places during the holiday season and are a mainstay of many family traditions. Ingestions of small amounts can lead to nausea, vomiting or diarrhea. Large amounts of holly can cause such severe gastrointestinal/GI symptoms that dehydration and electrolyte imbalances are possible. Holly however has a bitter taste and it is unlikely that most people will ingest large amounts of the plant unless they have other risk factors that lead them to eat more than expected. TIP: Still, to be sure, keep the plants high and out of reach of small children and check the floor for any falling berries or leaves. 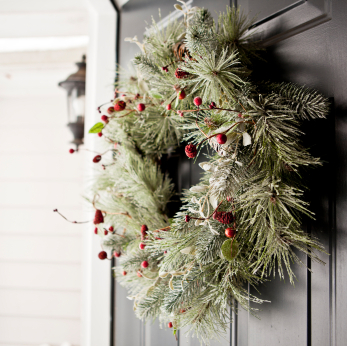 The evergreen wreaths are typically made of pine, holly or yew plants. Pine trees can cause some skin irritation, but the ingestion is unlikely to cause any severe problems. Yew plants, however, are toxic. They are evergreen plants with red colored berries, commonly seen in Midwestern landscaping. 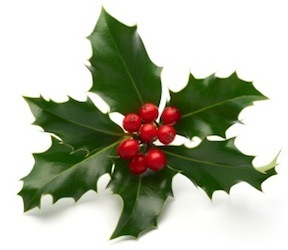 They are often used in wreaths because of the brightly colored green needle like leaves and red berries. The yew plant contains toxins that block the movement of calcium and sodium ions in and out of cells; this movement is essential to the functioning of nerves and the heart. Ingestion of a few tablespoons of leaves or berries can be fatal in adults, less for children. The Illinois Poison Center reported such a death in JAMA, so we know firsthand of the dangers of this plant. Fortunately, most exposures are trivial due to the reportedly sharp bitter taste of the leaves and/or berries thus only small amounts ingested that cause few if any symptoms. TIP: Know the names of all the plants you bring into your home. And as we mentioned before, be sure to keep the plants high and out of reach of small children. So who is most at risk? Individuals who lack the understanding of their actions in eating decorative plants such as those with development delay, psychosis, dementia, those with pica (desire to eat non-food products) or other impaired mental capabilities. Small children between the ages of 1 and 4. Before the age of one, most children lack the mobility to get into a lot of trouble (there are always exceptions to that rule!) and after the age of 4, children understand that they do not need to put everything they touch into their mouths (again, every child is different and some kids develop quicker or slower than others). The peak age for severe childhood poisoning is between 18 and months and 3 years of age. Look for other evergreen alternatives if possible to keep the holiday traditions and spirit festive in your homes, but without the risk of some of the traditional plants. If you have any questions or concerns due to holiday plants, please call the Illinois Poison Center at 800-222-1222. Don’t forget to check out the “My Child Ate…” resource center which gives toxicity level and treatment information for the most common substances/products ingested by children.